I always love to explore the local cuisine. I think it’s one of the best way to experience a new destination. Of course, I make room to try the finer places as well. Inside the St. Regis Princeville Resort, we came for Sunday Brunch and breakfast. 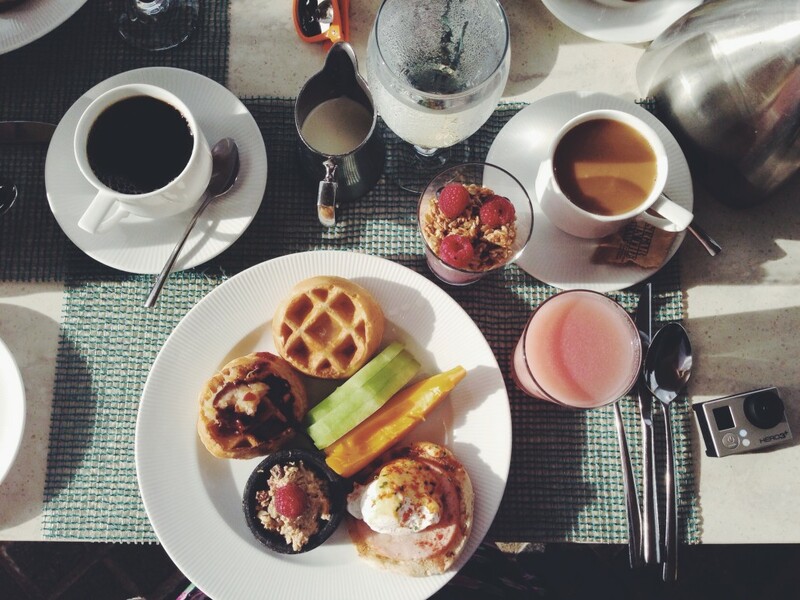 Buffet style fare offers a wide range of dishes — from Hawaiian twists in standard breakfast to local flavor. For instance, coconut syrup on mini waffles! I tried the Hawaiian Manapua, a steamed bun with roasted pork insides. Also, served was my favorites; sashimi, poke and king crab legs! I couldn’t get enough of the fresh guava juice, either. The food was delicious and the panoramic view of Hanalei Bay is very hard to beat. It’s a pretty sweet way to start the day. Makana was easy access for us, since we stayed at the resort. The service was amazing, as with all the staff throughout the property. Quite possibly the best shrimp we’ve ever had! Off the highway, this little place definitely has the best coconut shrimp on the island. Oh, the FLAVORS. 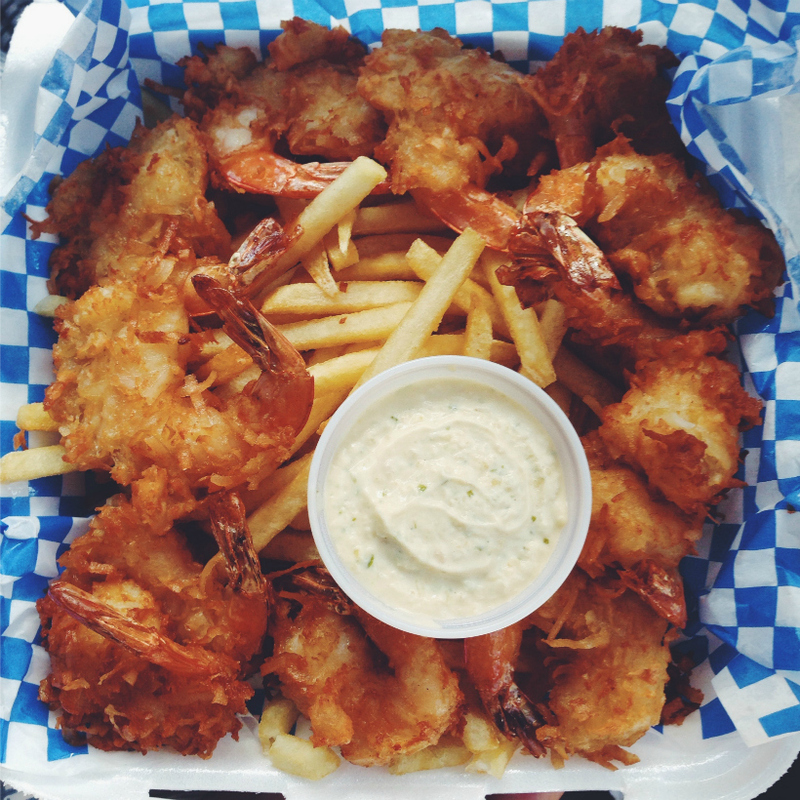 Cooked to perfection, both the Coconut Shrimp and Sweet Chili are easily on top of the local food hit list. Is it me or the shrimp out here just so much tastier?! 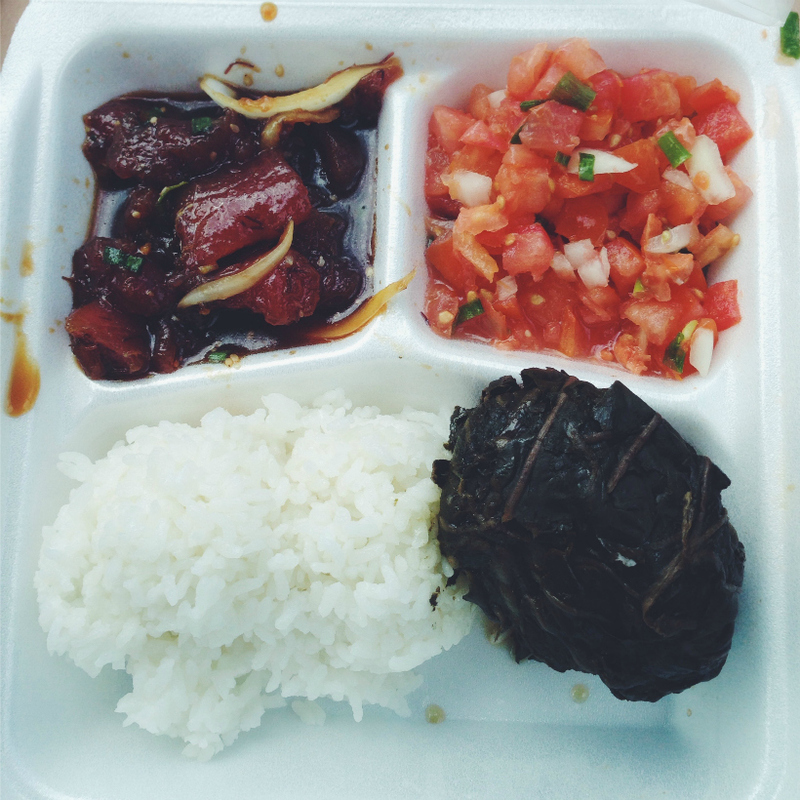 One of my favorite things to eat while in Hawaii is poke. I couldn’t get enough, in all different seasonings. Well this place has that and lau lau! Determined to cross off as many traditional dishes as possible, I found Pono. Lau lau is steamed meat wrapped in taro leaves. Delicious it was! We tried the pork and chicken laulau with clam poke, the potato mac salad, shoyu tuna poke, and lomi salmon. That’s as authentic as you can get in a lunch box. Please take me back, so I can eat here again! Back to our resort for some fine dining a la Jean Georges. We opted for the tasting menu mostly because I’m indecisive. It was a nice change of palate from our usual local flavors and adventure sandwiches. The decor here is super swanky, and perfect to enjoy a cocktail or two whilst dining. Service was, of course, always so pleasant. 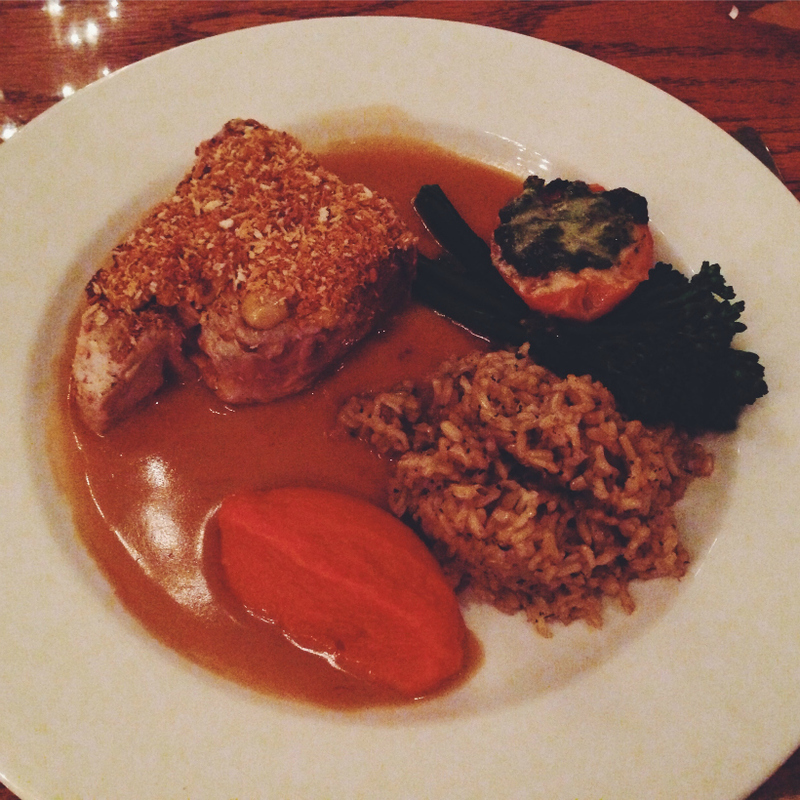 What I really enjoyed was the complexities of the dishes. 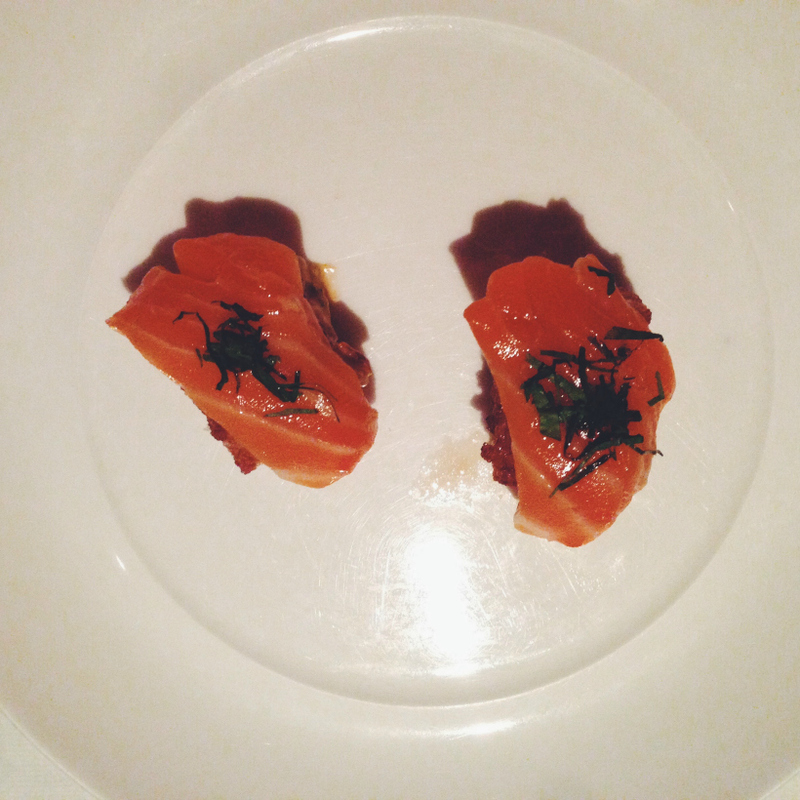 In the tasting menu, we had the salmon sashimi over a warm bed of crispy rice and the tastiest cream tomato soup to start. Next, was the steamed onaga with shitake mushrooms and asparagus. Lastly, we were presented with glazed short ribs with crispy grits and salad. By the time we were ready for dessert, I was already stuffed, but I definitely made room for the salted caramel ice cream sundae. Divine! This place is so cute and romantic. It looks like a house from the outside, and it is a house on the inside, too! The homey candlelit decor brought such a feeling of warm and fuzzies. The food is great too! 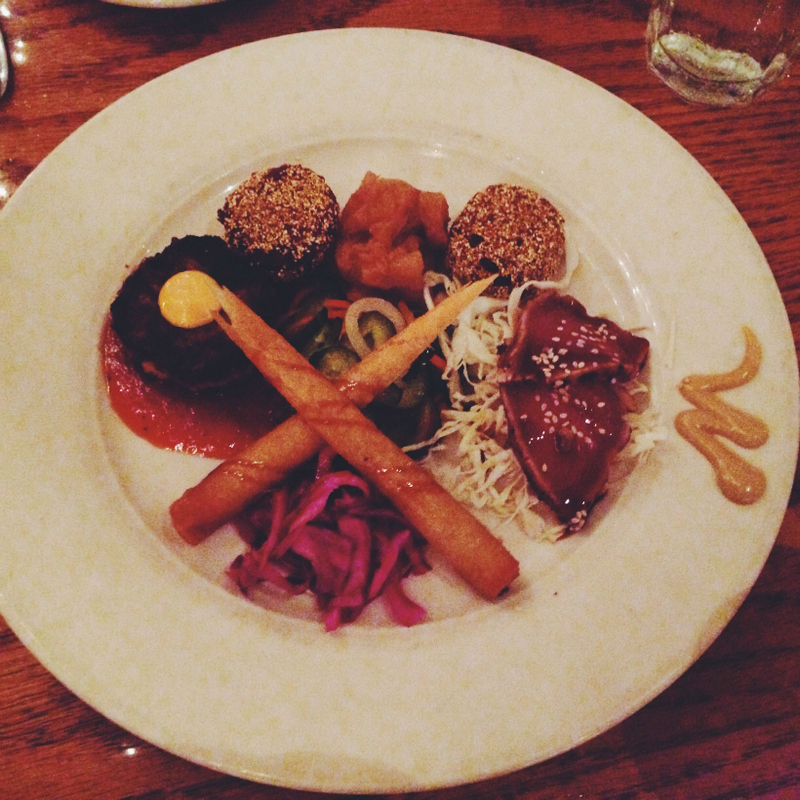 We ordered an appetizer sampler aka pupu platter which included the famous taro fritters, crab cake, seafood rockets and seared ahi. The chutney sauce is a MUST. As for the entrees, he went for the fish of the day (ono) while I opted for the wasabi crusted ahi tuna. The meal was delicious and the restaurant, charming. They give you a postcard at the end of the meal as a parting gift, d’aaw! This is definitely a must revisit! Yes, I went to Hawaii and got pizza. But, this was such a freaking delicious pie of thin crusted heaven. On a night when I was just too exhausted to head out for food, we got ourselves half a pie of the “Just Give Me the Meat, Baby” + half of “Power to the Pesto” and it was simply amazing. 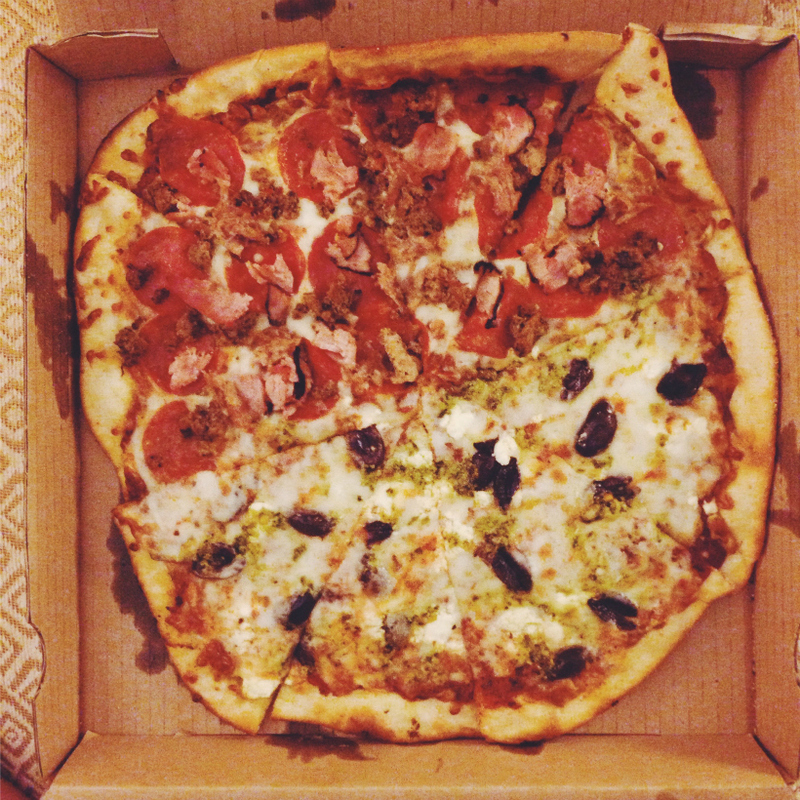 The melt-in-your-mouth flavors mixed together perfectly, and as a New Yorker, my pizza standards are high. After a long long day of exploring and hiking, we were so starved. A quick search on Yelp showed this place as the place to eat. This is where I got my hands on my first bowl of poke, and yes, it was amazing. Their ahi tuna wrap and fish tacos are a must try as well. The guys there were so chill, and I’m planning on coming back for the ahi wrap. The portions are huge, so come hungry! On our last day, we decided to go local again. While I was pretty good on knocking off many items off my list of traditional Hawaiian fare, I still didn’t get to the loco moco. The loco moco here, though, was so GOOD. We also had the Korean chicken, which quickly became his favorite. The best place to end our trip in Kauai. The restaurant is a little hard to find, and off in a remote warehouse area of town. 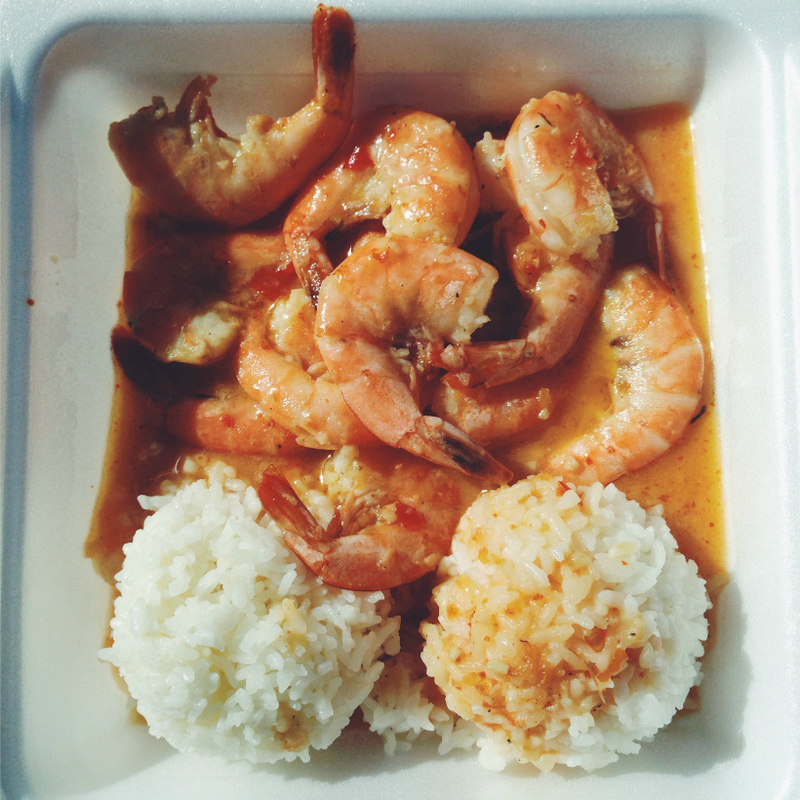 Like many of the local places I’ve frequented, expect immensely delicious food in a styrofoam box. More of a market than restaurant, but they have such a great selection of local fare and sushi. There’s also a big variety of poke available. For another night in our hotel room, we grabbed food from here — poke and Korean fried chicken. Everyone should explore this place at least one when they are here. Sadly, we missed the spam musubi — all sold out. Next time, next time! Overall, I was pretty pleased with our epicurean adventure. I was able to try almost all the traditional Hawaiian dishes. The only thing I really wanted to try but kept missing out everywhere was the spam musubi. I mean how can you go to Hawaii without trying it? I bet its a hot commodity, and that’s why its always gone by the time I get there. 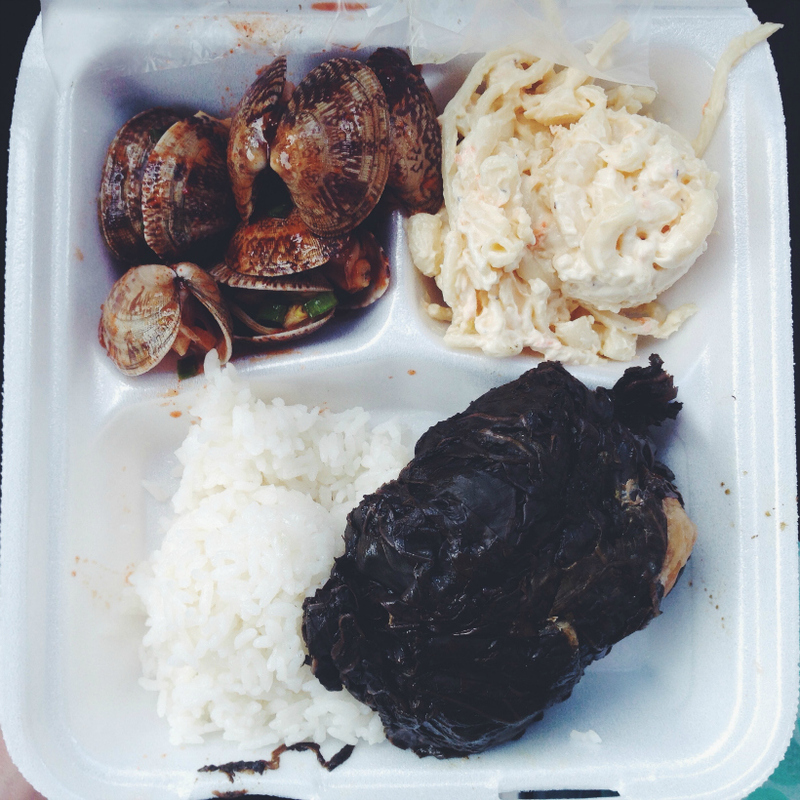 I love Hawaiian food. It’s such a blend of Asian dishes — the ultimate fusion, dare I say? !